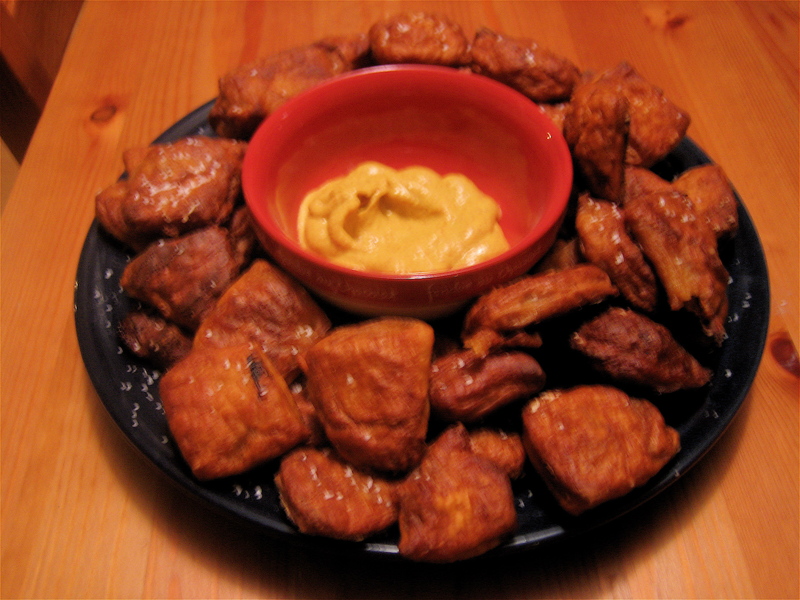 Pretzel bites…. I really have been wanting to try to make them, but didn’t want to be eating them all myself! I saw a recipe and a how-to guide to make them on The Kitchn. The recipe is a Martha Stewart concoction mentioned on Smitten Kitchen. My boyfriend had people over Friday night for a friend’s birthday, so I thought it was a perfect opportunity to try my hand at making them. It didn’t work out completely for a few reasons. 1) The recipe does not make 100 1” x 1” (pre-cooking) as stated – more like 60ish – so I stretched the dough out a little farther in an attempt to make more, 2) I don’t think 90 seconds on each side was long enough… and some of mine even went over on time (they shrivel if not cooked long enough), and 3) I should’ve made a better attempt to cut them into symmetrical pieces! With all of that being said, it was an interesting adventure, and not as difficult of a process as I thought it would be. I made the pretzels in the morning, baked them off and reheated them in a 350 degree oven to get them crunchy again about 45 minutes before people came, for about 8 minutes. They did taste good, but I think it will take a couple of times before I get them right! People seemed to like them, but who knows if they were just being nice 😉 A nice healthy dollop of spicy brown mustard helped! I will be trying these again, I am determined to make perfectly puffy pretzel goodness. They look like chicken nuggets in this picture!